With the tragic circumstances surrounding Phil Hughes death back in 2014 helmet manufacturers have taken steps to product that adds additional protection to the areas of the head located behind the ears and nape area. 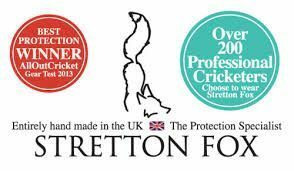 With this in mind Ayrtek Cricket have been working with multi award winning personal protection specialist Stretton Fox to produce the Nek-Tek Neck Guard product range. The range utilizes a high impact composite foam construction with a velcro attachment system that allows the product to be fitted to any helmet within the Ayrtek Cricket range as well as several other brands as well. The ventilated foam will ensure its breathable when in use at the crease or in the nets and the outer materials used will ensure comfort and durability so that if called into action the Nek-Tek is in the correct position to protect you. The Stock option is the standard black colour scheme with black Ayrtek Cricket branding placed upon it. The Custom version enables the customer to specify what colour/design and text they want upon the product. Such as name, squad number or Brand logo. Once ordered please get in contact via email to discuss your requirements. *Please note that the materials and final branding have been altered slightly from those featured in the product images.